The classification of the ribonucleases has been a matter of some contention. 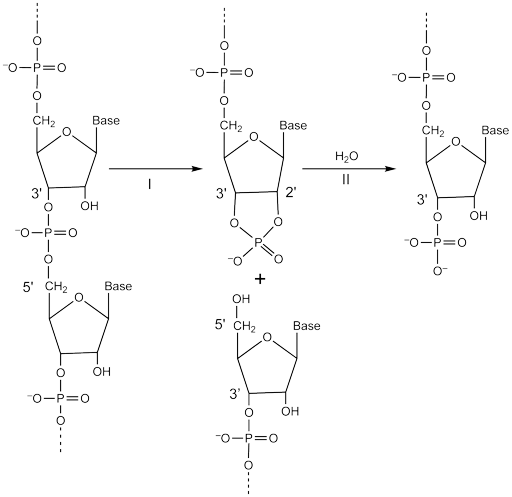 Whereas some appear to act as simple hydrolases, cleaving the 3′,5′-phosphatodiester bonds linking adjacent nucleotides, others, such as pancreatic ribonuclease, cleave to give a 2′,3′-cyclophosphate derivative, which is subsequently hydrolysed to the 3′-phosphate, as shown below. Pancreatic ribonuclease was listed among those enzymes transferring phosphate groups, Enzymes catalysing other phosphate-transfer reactions, as entry 502 in the Table of Enzymes published by Dixon & Webb in 1958 . When the Enzyme List was formally divided into specific reaction classes, it was listed as a transferase, (EC 2.7.7.16) in 1961 , but, since the overall reaction was hydrolysis, it was reclassified as a hydrolase (EC 3.1.27.5) in 1972 . However, it became clear that neither of these classification types adequately described the activity of this enzyme. The cyclophosphate produced in reaction I is actually released from the enzyme and the subsequent hydrolytic step (reaction II), which occurs by a reversal of reaction I with the hydroxyl group of water replacing the 5′-hydroxyl group of ribose, only occurring to any appreciable extent when the formation of the cyclophosphate product is essentially complete. Thus the reaction may be regarded as that of a lyase (a phosphorous-oxygen lyase) since it ‘cleaves bonds by means other than by hydrolysis or oxidation’. This is the class of enzyme where two (or more) substrates are involved in one reaction direction, but there is one compound fewer in the other direction and when acting on the single substrate, a molecule is eliminated and this generates either a new double bond or, in this case, a new ring structure. Because of this, pancreatic ribonuclease and some other ribonucleases have now been reclassified as phosphorous-oxygen lyases (EC 4.6.1.-). Those ribonucleases which appear to behave as simple hydrolases remain in EC 3 along with the DNases, which cannot form 2′,3′-cyclophosphate products. 1. Dixon M. & Webb EC. (1958) Enzymes, Longmans Green, London, pp. 185–227. 2. Report of the Commission on Enzymes of the International Union of Biochemistry (1961). Pergamon Press, New York & London. 3. Enzyme Nomenclature (1973) Recommendations (1972) of the Commission on Biochemical Nomenclature on the Nomenclature and Classification of Enzymes, Together with their Units and the Symbols of Enzyme Kinetics. Elsevier, Amsterdam. Six enzyme classes have been recognized since the first Enzyme classification and nomenclature list was first approved by the International Union of Biochemistry in 1961. These were based on the type of reaction catalysed: Oxidoreductases (EC 1), Transferases (EC 2), Hydrolases (EC 3), Lyases (EC 4), Isomerases (EC 5) and Ligases (EC 6). However, it has become apparent that none of these could describe the important group of enzymes that catalyse the movement of ions or molecules across membranes or their separation within membranes. Several of these involve the hydrolysis of ATP and had been previously classified as ATPases (EC 3.6.3.-), although the hydrolytic reaction is not their primary function. These enzymes have now been classified under a new EC class of translocases (EC 7).The reactions catalysed are designated as transfers from ‘side 1’ to ‘side 2’ because the designations ‘in’ and ‘out’ (or ‘cis’ and ‘trans’), which had been used previously, lack clarity and can be ambiguous. The comments associated with each entry then describe the specific translocations catalysed. EC 7.6 contains those catalysing the translocation of other compounds. Exchange transporters that are not dependent on enzyme-catalysed reactions, such as the exchange of ions across membranes, are not included and pores that change conformation between open and closed states in response to phosphorylation or some other catalysed reaction are classified under EC 5.6 (Macromolecular conformational isomerases). The Protein Databank (PDB) includes many examples of phosphoryl transferase enzymes (EC 2.7) that contain phosphates or polyphosphates and their derivatives or mimics. A new IUPAC Recommendation published in Pure and Applied Chemistry* recommends how to identify and uniquely identify each atom of the phosphate or polyphosphate. For monoesters the phosphorus atoms are identified as PA, PB, PG, PD, etc., starting from the ester end. For diesters the new recommendations explain how to determine which ester should be used to number the phosphorus atoms. When both a nucleic acid and a non-nucleic acid groups are present, the former takes precedence. If both are nucleic acid groups, then alphabetic order (A > C > G > T > U) is used. With phosphate multi-esters, the phosphorus atoms are identified by the position at which they are attached. For example, in fructose 1,6-bisphosphate the two phosphorus atoms are named P1 and P6. In polyphosphates the phosphorus atoms are named PA1, PB1, PG1, etc. The oxygen atom directly bonded to the sugar moiety is numbered using the number of the carbon it is attached to. For example, in ATP it is O5′. The other three oxygen atoms of PA are named O1A, O2A and O3A, where O3A bonds to PB, O1A is pro-R, and O2A is pro-S. When a terminal phosphoryl oxygen is replaced by sulfur, fluorine or nitrogen, the remaining two oxygen atoms are prochiral and are identified accordingly. For example, for ATP with a sulfur substitution, the sulfur atom is named S1G and the two oxygens are O2G (pro-R) and O3G (pro-S). Where the oxygen is hydrogen bonded to an adjacent amino acid (with bond length 3 Å), the primary sequence number of the amino acid is used to determine the oxygen numbering, as in O1A, O2A, O3A, etc. Other topics discussed in this recommendation include substitution by other atoms, trigonal bipyramidal phosphate transition state analogues, and metal coordination. *Pure Applied Chem. 2017, 89(5), 653–675 DOI 10.1515/pac-2016-0202. Cytochrome P-450 enzymes (CYPs) are a large family of heme-containing proteins found in all kingdoms of life. The term "P-450" is derived from the spectrophotometric peak at the wavelength of the absorption maximum of the enzyme (450 nm) when it is in the reduced state and complexed with carbon monoxide. More than 50,000 distinct CYP proteins have been described. The CYPs are classified into several groups, the main ones being eukaryotic microsomal enzymes, eukaryotic mitochondrial enzymes, and bacterial enzymes. While most CYPs require electrons that originate from NADPH, almost no such enzyme can receive the electrons directly from NADPH, and a secondary electron transfer protein is involved. The classification of CYPs by the Enzyme Commission is determined by the type of reaction they catalyse and the type of electron donor with which they interact. For microsomal enzymes, the usual electron donor is EC 1.6.2.4, NADPH-hemoprotein reductase. When the reaction involves monooxygenation and formation of a single molecule of water, the enzyme should be classified under EC 1.14.14: oxidoreductases acting on paired donors, with incorporation or reduction of molecular oxygen, with reduced flavin or flavoprotein as one donor, and incorporation of one atom of oxygen into the other donor (e.g. EC 1.14.14.16, steroid 21-monooxygenase). Bacterial CYPs usually utilize ferredoxin. These enzymes are classified under EC 1.14.15: oxidoreductases acting on paired donors, with incorporation or reduction of molecular oxygen, with reduced iron-sulfur protein as one donor, and incorporation of one atom of oxygen into the other donor (e.g. EC 1.14.15.8, steroid 15β-monooxygenase).Mitochondrial CYPs utilize a specialized ferredoxin, known as adrenodoxin, as their electron donor, and are thus also classified under EC 1.14.15. (e.g. EC 1.14.15.15, cholestanetriol 26-monooxygenase). When the reaction involves the formation of two molecules of water, the enzyme should be classified under EC 1.14.19: oxidoreductases acting on paired donors, with incorporation or reduction of molecular oxygen, with oxidation of a pair of donors resulting in the reduction of O2 to two molecules of water (e.g. EC 1.14.19.52, camalexin synthase). Exceptions do occur — for example, CYPs from the CYP74 family catalyse dehydration reactions that do not require oxygen or an electron donor and are classified under EC 4.2.1 (e.g. EC 4.2.1.121, colneleate synthase). A number of CYPs catalyse an isomerization reaction and should be classified under the proper sub-subclass for the particular isomerization reaction (e.g. EC 5.3.99.4, prostaglandin-I synthase). Unfortunately, in the past many CYPs have been misclassified under EC 1.14.13, which should be used for enzymes that use NADH/NADPH as their direct electron source. In the coming months these entries will be reclassified under the proper sub-subclass. Besides the eukaryotes and the prokaryotes, the archaea represent the third domain of life. They are unicellular and similar to bacteria in shape and size, but their metabolism resembles eukaryotic behaviour in many aspects, notably the enzymes involved in archaeal DNA replication. Archaea are ubiquitous and have been found in practically all environments. Species living under extreme conditions such as hot, highly saline, alkaline or acidic waters, or under high pressure in the deep sea, were the first to be discovered. These "extremophiles" developed special strategies to maintain the stability of their cellular structure and to thrive despite limited nutrient supply, making for unique and interesting enzymes. In this short communication we will list of a few of the specialized enzymes found in archaea. For surviving under harsh conditions the cellular structures must be highly stable. Archaeal membranes achieve that by containing archaetidylserine (2,3-bis-(O-phytanyl)-sn-glycero-1-phospho-L-serine), which is based on glycerol ether components instead of glycerol fatty acid esters. The enzymes involved in the biosynthesis of archaeal lipids have been newly classified and are shown in the diagram for archaetidylserine biosynthesis. Polyamines are required to maintain the stability of double-stranded DNA. Where eukaryotes and prokaryotes produce linear spermine and spermidine, archaea synthesize branched-chain and long-chain polyamines, such as N4-bis(aminopropyl)spermidine or caldopentamine, which confer a higher stability. The enzymes involved in their synthesis are classified as EC 2.5.1.127 and EC 2.5.1.128. During their long evolution archaea developed strategies for taking up nutrients very efficiently. The substrate specificity of archaeal enzymes is often less strict than that of their bacterial counterparts. For example, two new enzymes of the archaeal Entner-Doudoroff pathway have been described, one being able to dehydrogenate either glucose or galactose (EC 1.1.1.360) and the other, with even less specificity, is able to dehydrogenate a broad range of aldoses (EC 1.1.1.359). In addition, archaea do not follow the classical route of the Entner-Doudoroff pathway, and instead use semi- or non-phosphorylative variants. Three enzymes that participate in these pathways have been newly classified: EC 1.2.1.89, EC 1.2.99.8 and EC 4.1.2.55. Fatty acid desaturases are enzymes that convert a single bond between two carbon atoms in a fatty acyl chain to a double bond. A common property for all known desaturases is their requirement for molecular oxygen and a source of electrons. The classification of desaturase enzymes is complicated by the fact that they can be classified by several criteria. First, they differ in their substrate preferences. Free fatty acids are very rare in the cell, and fatty acids are usually found bound to either coenzyme A, acyl-carrier proteins, or as part of a glycerolipid. Desaturase enzymes are specific for one of these forms, and often are also specific for a substrate of a particular size or size range. Next, the enzymes differ in their electron donor. Most fatty acid desaturases utilize electrons provided by either ferredoxin or cytochrome b5, although some exceptions do occur. In many of the cytochrome b5-dependent enzymes gene fusion has resulted in a cytochrome b5 domain integrated into the enzyme. The enzymes can also be classified based on the position of the double bond that they introduce - some introduce it at a certain distance from the carboxylic end of the fatty acid, others determine the position based on its distance from the methyl end of the substrate, and yet others introduce the new double bond only at a particular position relative to an existing double bond. Finally, desaturases differ in the type of bond they introduce mdash some introduce a cis (Z) bond, others introduce a trans (E) bond, yet some introduce a mixture of both types. Owing to the rapid increase in the number of different desaturases that were discovered in bacteria, algae, plants, fungi, and animals, the existing classifications in the Enzyme List became unsatisfactory. We have recently reviewed the existing literature and updated the list, resulting in a major revision of the fatty acid desaturase entries. We have revised most of our existing entries to eliminate ambiguity and added a large number of new entries, achieving close to full coverage of current knowledge in the field. We tried to address all of the considerations described above. For example, EC 1.14.19.35 stands for sn-2 acyl-lipid ω-3 desaturase (ferredoxin), an enzyme that acts on acyl chains attached to position sn-2 of glycerolipids, introduces a double bond three carbons away from the methyl end of the chain, and accepts electrons from ferredoxin. Naturally, additional information can be gathered by looking at the reaction equations and reading the comment and references. To see the entries, search the list for the name "desaturase" and scroll down to the entries that start with 1.14.19.